Cocktail vs Sitdown – The Format Debate! My mum still vows that my Cousin Fiona’s cocktail wedding was the best she has ever attended – it was fun, there was plenty of seating and the dance floor was epic. All I remember was the emerald green and lace atrocity dress she let me leave the house in at 10, so I can’t confirm her theory. However, working at an event venue you see the age old debate over wedding styles as each couple comes through. Whilst the tradition of a sit down wedding dinner is still extremely prevalent, there has been an increasing popularity of cocktail weddings over the past few years. What are the deciding factors? How do you choose between formats? There are a few concerns about cocktail events that often deter hosts – will there be enough food? Will my guests have to search for said food? And a lack of adequate seating is always a worry. These all have to be solved to deliver a great hand held event. Presence of food is extremely important. Guests want to know that there is food readily available and their night won’t turn into a scavenger hunt for nibbles! Whilst 3-5 canapés per guest might be acceptable at your 21st birthday, this is not at all suitable for a wedding. As a venue it is never acceptable for guests to leave hungry, as a host you definitely don’t want guests doing a Macca’s run on the way home. 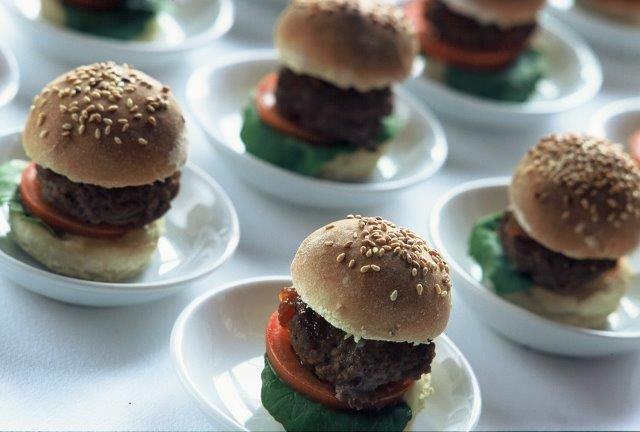 As a general guideline, you want to ensure that your guests are not only receiving delicious canapés but some more substantial items as well – items often served in noodle boxes or small bowls, designed to fill your guests up – but also display the presence of food at your event. Seating presents the next issue – after the long proceedings and the walk in heels to the venue (aimed at the ladies), the thought of having to stand for another 5 hours is more than a little daunting. The ability to seat half of guests at one time is a good amount of furniture both visually and operationally. It is important to dress your space with furniture and make it appealing – achieved by décor, lighting and a mixture of furniture offering different heights and dimensions. Bar stools, high bars, low lying ottomans and some tables are a great way of achieving this layered look. A few guests are bound to end up heel-less, however a range of perches ensures the likelihood is significantly lowered! The last obstacle to overcome is often expectation. Whilst it is your wedding day and ultimately the choice is yours, some families would never accept the concept of a hand held event. Consider the demographic of your guests- if you have largely older guests chances are they will spend majority of the evening seated. If this is the case a dinner almost always works better. So much of the appeal of a cocktail wedding is the interaction of guests, there are no seating allocations and place cards, just freedom to wander around and speak with whomever one chooses, creating a brilliant lively atmosphere to celebrate in! Most importantly, ensure that the venue selected can offer solutions to all of the above to your satisfaction. No couple should ever be stressed on their wedding day and the only way to avoid it is to cover all your bases before the big day. Make sure you check out the other side of the Cocktail vs Sit-down debate.